Upon activation of your Broker Brain website you will likely have multiple properties that you will need to import into the system. Although you will typically add new properties from the Properties tab, the process to import multiple properties is done from the Import tab. It is important to note that you can only import properties for one market at a time. Before beginning the import process, make certain that all property clients for the incoming properties have been added into the Broker Brain system. Properties with clients not recognized by Broker Brain will not properly import. See the Clients section of this document for more information on how to do this. Option 1: Type addresses directly into the Import String box. Separate information (street address, city, state, etc.) by either a comma or a space. Option 2: if you have the addresses listed in an Excel spreadsheet or a word processor, you can copy the data from there and paste it into the Import String box. To do this, copy the data from the appropriate application, switch over to Broker Brain, then right-click in the Import String box and select paste. It is recommended that you include any header information when you copy the data. 4. In the Import Type field, indicate how the data in the Import String field is separated. Select CSV for information that is separated by commas, or TAB for information that is separated by tabs or spaces. 5. Broker Brain uses Google Maps to validate its addresses. If you want to be able to import properties that fail this validation, check Ignore Google Geocode results on failed properties. This will import all properties you are adding. Those properties that fail the validation will not display a property map (this typically displays under Properties>Main>Properties tab for a selected property). 6. If you are bringing in a header row, indicate this by selecting the Has Field Header check box. If the property data is located in the line directly below the header, put a 1 in the Lines Before Data box. If there is an empty row or two between the header and the property data, indicate how many lines there are above the data, including the Header information. For example, if there is a header line plus an empty row above the property data, you would enter a 2 in the Lines Before Data box. 7. Choose the Status for your incoming properties. 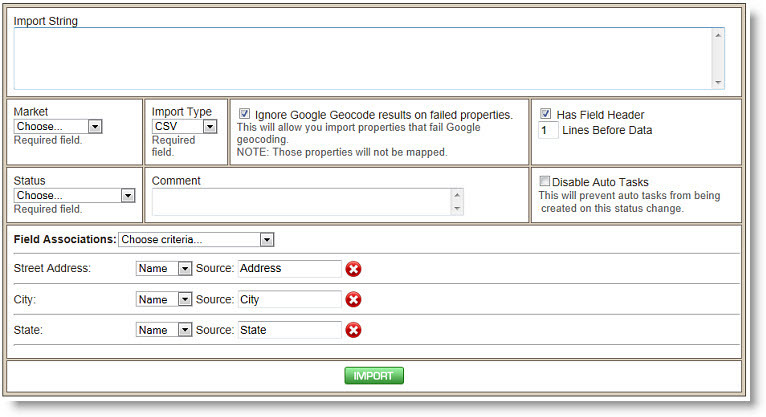 If you are importing a large amount of data and will be updating individual property information after the upload, it is recommended that you create a property status called Import, and set that status here in this field (for information on how to create an Import Property Status, see the Property Status Help section in this document). This assures that all properties are handled after the import. Once you have assigned a client to a property, you can change it to the appropriate status. Once all of the properties are moved out of the Imported status, you can delete that status from the system. 8. If there are any comments about the import that apply to all properties being imported, note them in the Comment field. 9. It is recommended that you place a check mark in the box next to Disable Auto Tasks when you perform an import. Field Associations tell Broker Brain how to link your imported information into established Broker Brain fields. You will need to set a Field Association for each type of data you are bringing in. In the Import String example shown in #2 above, Address, City, and State fields are being imported, so a Field Association was created for each in the example shown below. To set a Field Association, click the drop-down box next to Choose Criteria and select the field that should link with your first column of data (for instance, Street Address). Once you do that, you will see that association appear below the Choose Criteria drop-down box. Continue to set associations for each type of information you are importing (in the example below, city, and state). Note: To remove an unwanted Field Association, click the Red X shown add the end of that row. If you are importing a Header Row along with your data, you will need to link each column name to Broker Brain here. Next to each Field Association, there is a drop-down box called Name. Leave this box set to Name and in the adjacent Source box, type in the name of the column as shown in the Header row you are importing. In the example shown above, our Street Address header is simply called Address, so we identified that here. Note: Broker Brain may rearrange the Field Associations you add into a different order than you enter them. Important: If you do not type a column name in the Source field, this column of information will not be imported. If you are NOT importing a Header Row, Field Associations are set up by column number, rather than by column name. To set this up, click the Name drop-down box and select Column, then in the adjacent Source field, type the location of the column, numbering the first column on the left at 1 (see second diagram below). Duplicate - If an address has already been imported into the Broker Brain system, a status of Duplicate will appear in orange. If you wish to import duplicate items, click the Import Duplicates box above the green Complete and Cancel buttons. This will bring those properties into Broker Brain again, thus showing them twice in the system. Be aware that once you have imported an address, it cannot be deleted, so in most cases it is not recommended that you import duplicate addresses. Fail - Broker Brain verifies all addresses being imported with Google maps. If it cannot match an address, it will show a status of FAIL, highlighted in red. OK - Items that show a status of OK are ready to be imported. 12. If your addresses all have a status of OK, click the green Complete button. This completes the import. If you have addresses with a status of DUPLICATE or FAIL, click the green Cancel button. This will redirect you to the Import screen where you can make changes to the addresses and try importing them again. Once properties have been imported into Broker Brain, they cannot be deleted. They can, however, be archived so as not to impact your pricing plan. Any addresses that cannot be resolved against Google’s database will return as failures and will need to be manually entered into the system.